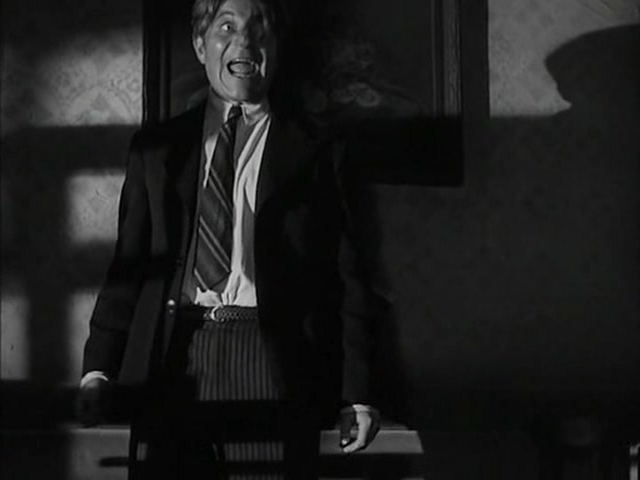 Jean Gabin reacts to the publication of the latest edition of The Forgotten, over at The Daily Notebook, right now. I’ll respond to comments once I’m done flying the Atlantic. This entry was posted on July 8, 2010 at 5:16 am and is filed under FILM with tags Gueule D'Amour, Jean Gabin, Jean Gremillon, The Daily Notebook, The Forgotten. You can follow any responses to this entry through the RSS 2.0 feed. You can leave a response, or trackback from your own site. Mainly it just seems a little uninspired. And Lizard in a Woman’s Skin doesn’t seem tame at all — the arm slicing is memorably horrible still. Touchdown? Have you fallen for American football that fast? Seriously, I assume Feyder is becoming more available because of time spent in America and an association with Garbo. I’d heard of Gremillon but never saw even a VHS copy of any of his films. I can’t imagine that more than a couple were ever released in the US. And not here either. On film, maybe, back in the 30s, but never on home video. Although there was a time when the BBC might have troubled to show them, or equally obscure French 30s work. So that’s the back of your head in this new banner? Nice view. Hm, there was a Gremillon VHS released in the US, Pattes Blanches. A surprise to me, that’s for sure. That picture only serves to remind how subtle an actor Jean Gabin was capable of being when the material was up to his standards, doesn’t it? I’m beginning to understand why the French are so enamored of Jerry Lewis, whose cool aplomb never fails to impress. Why are you flying the Atlantic again? Well, that Grauniad writer deserves some sort of credit for confusing THE LIVING DEAD AT THE MANCHESTER MORGUE with a giallo and Jorge Grau with an Italian. “English horror-hacks” indeed! “I’ll polish my spectacles for a better look.” or words to that effect. American visit purely social, although I hope to take in some of the Mann retrospective (Anthony, not Michael or Daniel). I’m guessing Patterson was asked to write something about both films and thus got the old shoehorn out, forgetting that Grau is a rather unItalian name. If the piece was his idea then it’s a worse mistake. I guess the misuse of “giallo” is an attempt to stretch the definition around his article to hold it together. The pursuit of some sort of big connection distorts all the details. I like a lot of Patterson’s stuff, but I think he’s getting tired maybe? Pattes Blanche is very Carson McCullers, and L’Amour d’un Femme ((Micheline Presle as a doctor in a seaside village with Massimo Girotti as her love interest) is superb, as is Remorques with Jean Gabin. Nice to see Fulci and Grau mentioned at all really. Had thought to mention the Anthony Mann retrospective, but I figured that you’d seen most of his films already. Though it’s always nice to see them on the big screen. Have never actually watched El Cid, as I couldn’t get it in the right ratio until recently. And some of the early Bs are extra-hard to source, so I never saw Dr Broadway. I do like the amnesiac screwball-noir Two O’Clock Courage, featuring a young Bette-Jane Greer. Am still a beginner with Gremillon, but have several Lined Up. Maldone was the subject of an early Forgotten. Lumiere D’Ete must obviously be found as soon as I get home, although I’d hesitate to compare anything to Rules of the Game. Not because it’s great, but because it’s so strange: I really can’t wholly assess it’s success because it’s so mysterious to me. Rules of the Game mysterious? Not to me. It’s just about a country weekend that goes sour. Toutain seems to have done other roles that didn’t involve jumping about… dying at the end, in such a non-heroic way, must have challenged his fans though. I think some of the hostility must have also been to do with the sourness, and the fact that we are uncertain how to respond to a lot of it… it gets into that funny-awkward-tragic area where sometimes audiences object because they’re ot being manipulated in the conventional and clear-cut ways. And sometimes they assume the filmmaker is incompetent. Never seen EL CID myself either, though I recall catching the end on television many years ago and was very impressed, maybe “blown away” is a more accurate term. I really would like to see it in its entirety. Recently read over a passage found in John Baxter’s Kubrick bio that relates Mann’s involvement in the making of SPARTACUS. The original choice for director, he began work on the film but according to Baxter Kirk Douglas decided he wanted Mann off the film. Douglas said he thought Mann “seemed scared of the scope of the picture”, which time proved otherwise (witness EL CID and THE FALL OF THE ROMAN EMPIRE). Baxter also states that Mann preferred understated performances, and wouldn’t tolerate Douglas’s “overplayed acting”. Douglas also resented Mann’s chumminess with the British cast members, who were unimpressed with the actor’s self-possessed “star status” and “hectoring manner”. A year prior to the making of the film Olivier suggested to Douglas that he, Olivier, both star and direct SPARTACUS. I would’ve loved to have seen the look on Kirk’s face when Larry presented him with that proposal. I don’t think Douglas is the most reliable narrator, so I’m guessing he removed Mann just because he didn’t like the idea of Spartacus Mann was pushing. Mann certainly had a sense of the epic. Oddly, if Mann was indulging the Brits too much, there’s no sense in Kubrick’s version that he was trying to rein them in: Ustinov is completely himself and very funny. Ustinov’s stories about the film are also better than KD’s. He might even be right, except that I think Spartacus is a big spectacle rather than a great work of art, so it doesn’t really have the kind of unity artistically where Ustinov’s japes could be damaging. It’s more like a big smorgasbord of flavours rather than a beautifully designed meal. There’s been recent underground activity in the US to bring Gremillon’s films some measure of visibility, at least through museum and cinematheque showings, if not through DVD releases yet. The one film that strikes me as most likely to attract commercial attention at this late date, if anyone were to try, is GUEULE D’AMOUR, quite a scorcher thanks to the casting of Jean Gabin opposite an unconscionably glamorous Mireille Balin. Two other Gremillon productions, both excellent, that play very occasionally are L’ETRANGE MONSIEUR VICTOR and LE CIEL EST A VOUS. One of the revelations of the new DVD of EL CID is the report that Charlton Heston and Sophia Loren actually loathed each other: they were also contracted to co-star in FALL OF THE ROMAN EMPIRE, but Heston testily withdrew, leaving Stephen Boyd to take his role, choosing instead to do the less interesting 55 DAYS AT PEKING. In any case, their love scenes together in EL CID speak to their skill as actors, and are now all the more amusing to watch!. Mann felt Boyd really let the film down, but I think it’s more of a character player’s role. The fact that the character refuses to take the reins of empire, and all the bad stuff that happens after can be blamed on him, makes him kind of a bad hero. I’d assumed Heston dropped out because he didn’t get to be the guy who single-handedly saves the Roman Empire. Wonder what his problem with Loren was. Gueule D’Amour is the first really pristine, subtitled Gremillon I’ve laid hands on, so there seems a big problem of availability there. Would love to see the films projected.